Who's the most creative in Latin America? 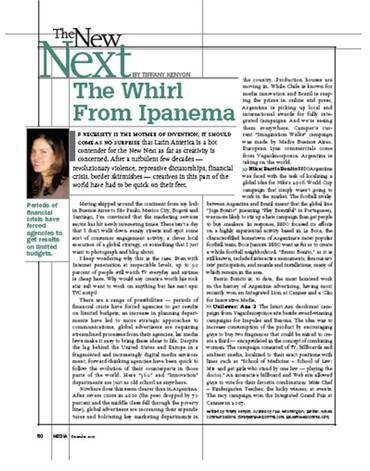 I've been traveling for what seems like months and have been meaning to post this New Next article that I've had published in Media Magazine in the US (below is the original text, it was american-ised a bit by the editor in the printed version). If necessity is the mother of invention, it should come as no surprise that Latin America is a hot contender for the New Next as far as creativity is concerned. With most countries in the region having experienced a turbulent few decades - revolutionary violence, repressive dictatorships, financial crisis, near border skirmishes - creatives in this part of the world have had to be quick on their feet. It’s been over a year since I arrived in Argentina with the challenge of servicing Naked’s global clients in Latin America. Having skipped around the continent from my hub in Buenos Aires to Sao Paolo, Mexico, Bogotá and Santiago I’m convinced that the marketing services sector has hit newly interesting times. There isn’t a day that I don’t walk down sunny streets and spot some sort of consumer engagement activity, a clever local execution of a global strategy, or something that I just want to photograph and blog about. I keep wondering why this is the case. Even with internet penetration at respectable levels, up to 90 percent of people still watch TV everyday and airtime is cheap here. With statistics like this why would any creative worth his rock-star status be persuaded to work on anything but his next epic TVC script? There are a range of possibilities – periods of financial crisis have forced agencies to achieve results on limited budgets, an increase in planning departments have led to more strategic approaches to communications, global advertisers are requiring streamlined processes from their agencies, lax media laws make it easy to bring these ideas to life. Despite the lag behind the US and Europe in a fragmenting and increasingly digital media environment, forward thinking agencies have been quick to follow the evolution of agencies in those parts of the world. Here “360” and Innovation departments are just as old school as anywhere. Nowhere does this seem clearer than in Argentina. After severe crisis in 2001 (the peso dropped by 70% and the middle class fell through the poverty line), global advertisers are increasing their expenditure and bolstering key marketing departments in the country. Production houses are moving in. While Chile is known for media innovation and Brazil is reaping the prizes in online and press, Argentina is picking up local and international awards for fully integrated campaigns. And we’re seeing them everywhere. Camper’s current Imagination Walks campaign was made by Madre Buenos Aires. European Lynx commercials come from Vegaolmosponce. From being the creative celebrities within Latin America, Argentina is taking on the world. BBDO Argentina were faced with the task of localising a global idea for Nike’s 2006 World Cup campaign that simply wasn’t going to work in the market. The football rivalry between Argentina and Brazil meant that the global line “Joga Bonito” (meaning “The beautiful game” in portuguese), was more likely to stir up a hate campaign than get people to buy trainers. In response, BBDO focused their efforts in a highly experiential activity based in La Boca, the character-filled home town of Argentina’s most popular football team, Boca Juniors. They went as far as to create a whole football neighbourhood. “Barrio Bonito”, as it is still known, included interactive monuments, famous artist participation, murals and installations, many of which remain in the area as a shrine to Argentina’s football heroes. Barrio Bonito is to date the most awarded work in the history of Argentine Advertising having most recently won an Integrated Lion at Cannes and a Clio for Innovative Media. . The latest Axe deodorant campaign from Vegaolmosponce sits beside a bunch of award winning campaigns for Impulse and Rexona. The idea behind Axe 3 was to increase consumption of the product by encouraging guys to buy two fragrances that could be mixed together to create a third – fittingly encapsulated in the concept of mixing women. The campaign consisted of TV, billboards and ambient media, localized to their exact positions with lines such as “School of Medicine + School of Law: Mix and get girls who stand by one law – playing the doctor”. The culmination was an interactive billoard and website which allowed guys to vote for their favourite combination: Miss Chef + Kindergarten Teacher was the lucky winner who then appeared in person at special events. The campaign won the Integrated GP at Cannes 2007. 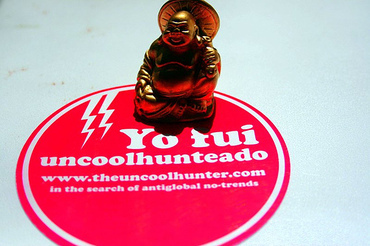 For a few months I've been dipping in and out of The Uncoolhunter: In the Search of Antiglobal No-Trends. It is sometimes dubious, always amusing and highlights the subversive humour that exists in so much of the advertising in Argentina. The founders were interviewed in an entire page article in the society section of Perfil this weekend, suggesting that this 'underdog' theme trend is reaching its tipping point.